Learn how the world's best SaaS companies chase leads and their email and voicemail sequences. A study conducted by Process Street in collaboration with PersistIQ examined the emails and voicemails sent by some of the world’s most successful SaaS companies to learn more about their sales cycles. Instead of focusing on individual communications like a single email or voicemail transcription, the study looks at every company’s full sales sequence to get a view of the bigger picture. To ensure the studied company used their best tactics, we signed up with the details of a fictional Vodafone employee. By automatically logging every incoming message (yet never replying or encouraging the companies), we compiled a database of over 1,000 emails and voicemails. 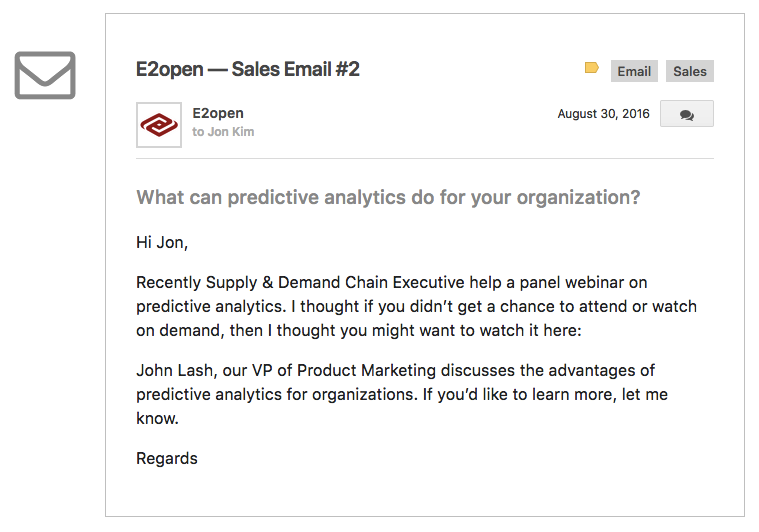 The analysis of this database — along with every message — is publicly available as a microsite: Inside SaaS Sales. 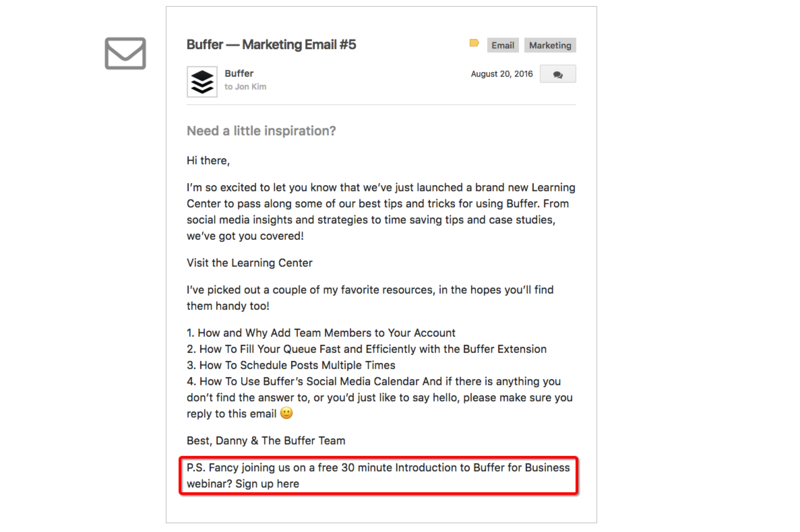 In this post, I’m going to extract 5 of the most directly actionable takeaways from the study, and share examples of great sales outreach along the way. A combination of hand-crafted and automated messages can help sales teams be consistent while ensuring personalization. In the study, we found that 65% of companies use some degree of automation. And, while 39% used pure automation (making it impossible for that company to send personalized outreach) and 33% relied entirely on hand-written emails, 28% used a mix of both methods. For example, sending an email straight after signup was a common tactic, used by many firms include GoodData, CA, and New Relic. New Relic’s main goal for new accounts is to prevent them from slipping away before they even get set up. The first setup step is logging in, so the first email pushes the new user towards that action. 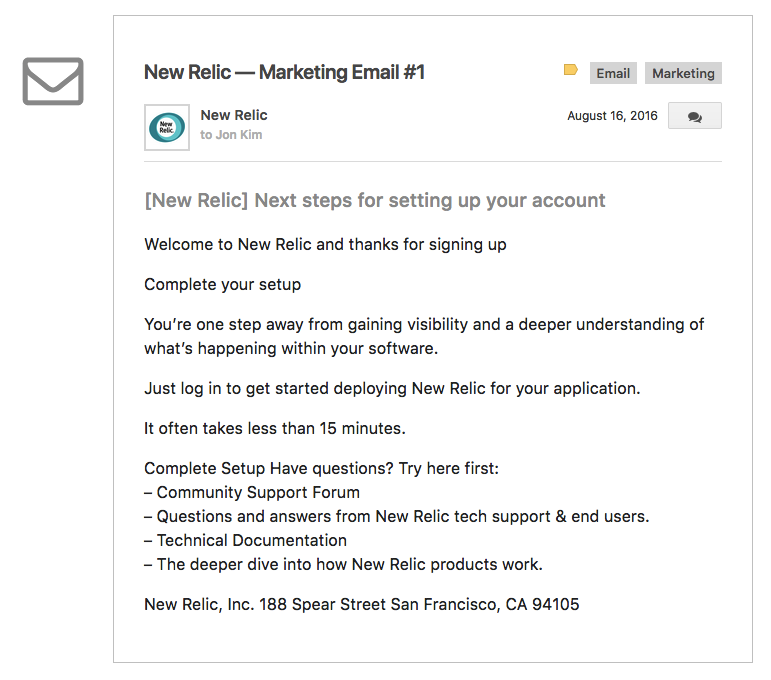 The process for setting up New Relic is a little more involved than that of a simpler SaaS tool, so New Relic offers common solutions to the problem: community support forums, Q&A, and access to the technical documentation. Action: Set up an automated email sequence that can run alongside a manual one, offering help to the most common issues new users experience. 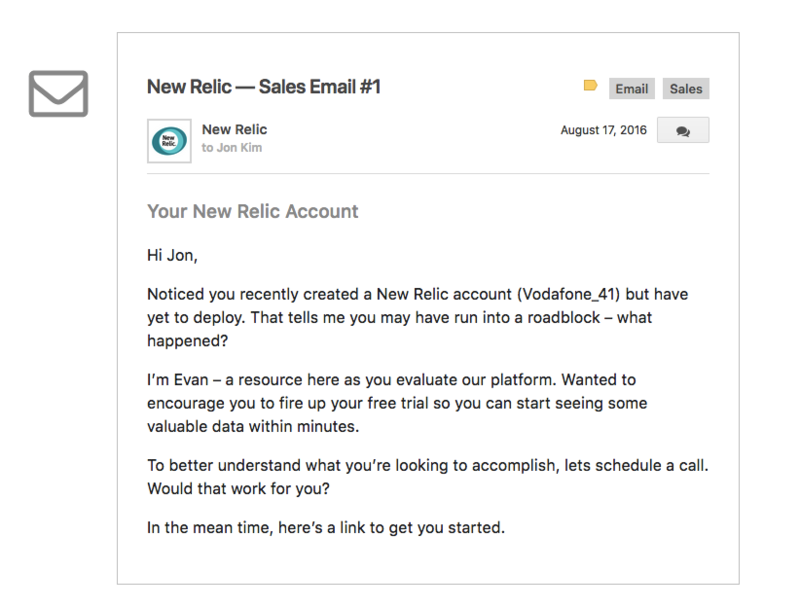 In the previous section, I looked at how New Relic identified an issue with a new account and reached out to help after the automated email didn’t get a click or a response. This technique can be used at any point of the sales cycle, and for any purpose. The more users you talk to, the more helpful you can make your email sequences (both manual and automated). Similarly, if your sequences are focused only on getting the sale or setting up a demo call, it can come across as too direct. 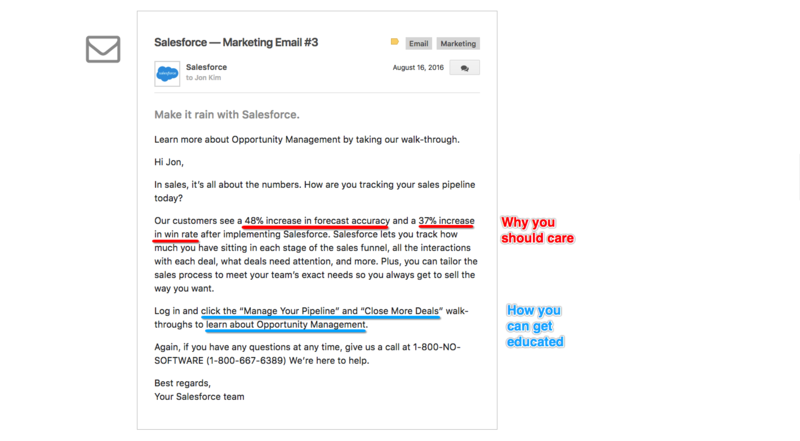 Every Salesforce email includes a sales call-to-action, but also convincing reasons why you should care, and links to product education. Getting a user to be hands-on with your software and learn how to use it can help cement the product’s benefits, improve the likelihood of conversion, and reduce churn. Action: Make sure your sales emails don’t just relentlessly push for the purchase. Play the long game and focus on education, but link that to tangible benefits. 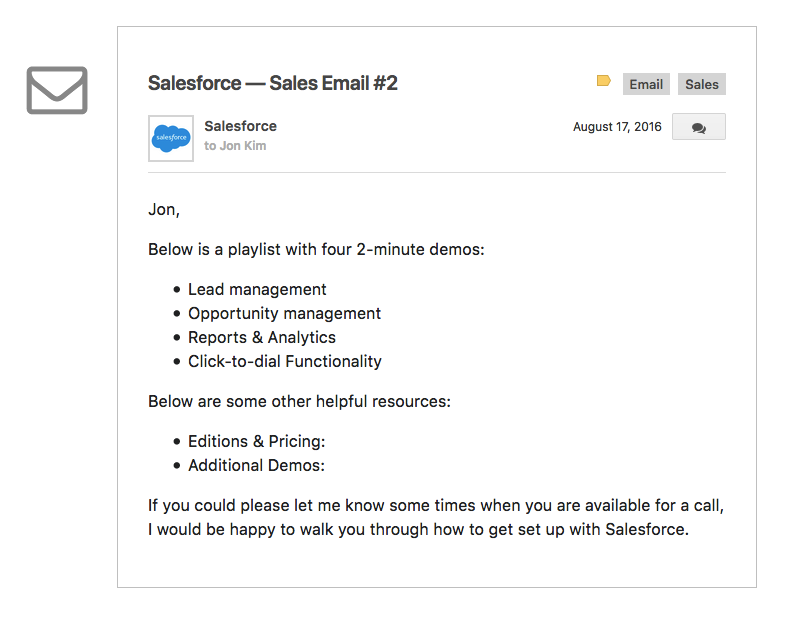 The most attentive sales teams aren’t content with manual emails. Companies that leave voicemails follow up for an average of 160% longer than those that don’t. This indicates a higher touch sales process, and is used by only 26% of companies. However, the method helps sales teams give their messages context and purpose. Trying to reach the lead with two different methods could also improve the salesperson’s chances of a response. Reaching out every one or two days sounds like a lot, but it’s the average rate we found in this study. The overall average is once every two days, but 41% of companies sent an email or left a voicemail every single day. Regular contact ensures you’re not forgotten about, helps remind the new user to activate their account, and keeps you top-of-inbox in case the lead needs to reach out for help. Despite the high frequency, the overall volume is quite restrained. On average, companies followed up for 9 days total, and the marketing drip campaigns contained just 3 emails. 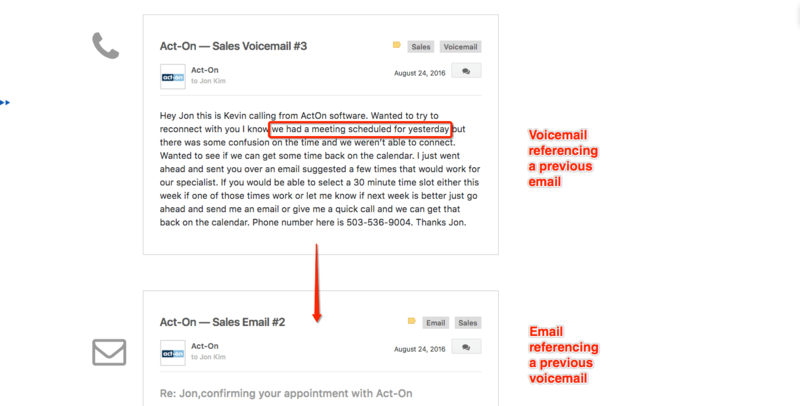 Action: Reevaluate your email and voicemail frequency; communication should be frequent, but not overly sustained. Although only 9% of companies in the study invite leads to webinars as part of their sales process, it’s still the most common tactic after offering demo calls and helpful resources. A study by GoToWebinar found that 73% of B2B marketers cite webinars as their #1 way to generate high quality leads, and that webinars are among the most effective and commonly used tactics for customer education. Action: Consider hosting a webinar either to generate leads — using top-of-the-funnel, general interest content — or educate existing leads and customers on the specific benefits of your product. You can see every finding and statistic from the study in this handy slideshow.